I made this curry as an evening meal on one of my fast days on the 5:2 diet. Prawns are a bit of a revelation as they are so ludicrously low in calories. Add to that a tin of tomatoes a chopped courgette, ginger, lemon juice and zest, garlic, turmeric, chilli, cumin and fresh coriander and you have yourself a tasty and very healthy meal. This is going to be a weekly winner for as long as I am on this diet and beyond – it is so very tasty. As I was aiming for as few calories as I could get for my buck, I served this with my brand new discovery – cauliflower rice!! Who knew that if you shoved a head of humble cauliflower into your mini-chopper that it would turn into the texture of rice. All you need to do with it really is microwave it for a few minutes until piping hot and serve. Miraculously there is not a strong taste of cauliflower and it goes very well as a rice substitute with curries and chillies. you want to know the best thing – a portion of this is only 25 calories – yes you heard me correctly! Now here is the most well thumbed book in my collection. Used on a weekly basis I have actually cooked around 22 recipes from it which is pretty impressive. This creation was a first. Essentially I griddled coins of courgettes until they were beautifully brown and mixed them with chilli and lemon juice, when cooled I tossed them with cooked green beans (cooled) and mixed leaves and the whole affair was drizzled with a heady little tahini based dressing (tahini, lemon zest and juice, orange juice, honey, garlic and olive oil). This was a nod to the flavours of the wonderful Yottam Ottolenghi and a successful nod at that. Mr Grumbling Tummy not quite as impressed so not a weekly staple but I will wheel it out from time to time to make my own tummy smile. 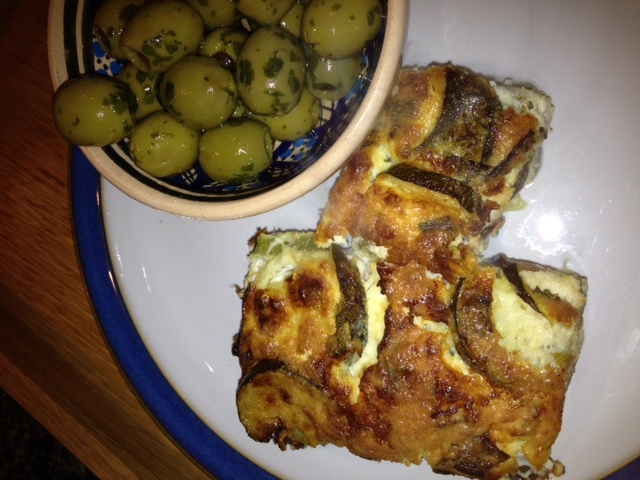 I served it with griddled Halloumi – yum! I am an avid Nigel fan however I am rather reliant on his 30 Minute Meal’s which means that the recipes in this book have been somewhat neglected. My friend Cat is a fellow admirer of the great Mr Slater and this is a dish that I have tasted at her house many time. It is so stupidly simple, gloriously rustic and just so darned tasty, that I am a little confused as to why I have not got round to making it before now. Even the most work weary cook will manage to put this together with their eyes closed. Mackerel flaked amongst discs of uncooked potato in a shallow oven dish, lovingly smothered with a mix of cream and grainy mustard and shoved in an oven to cook. 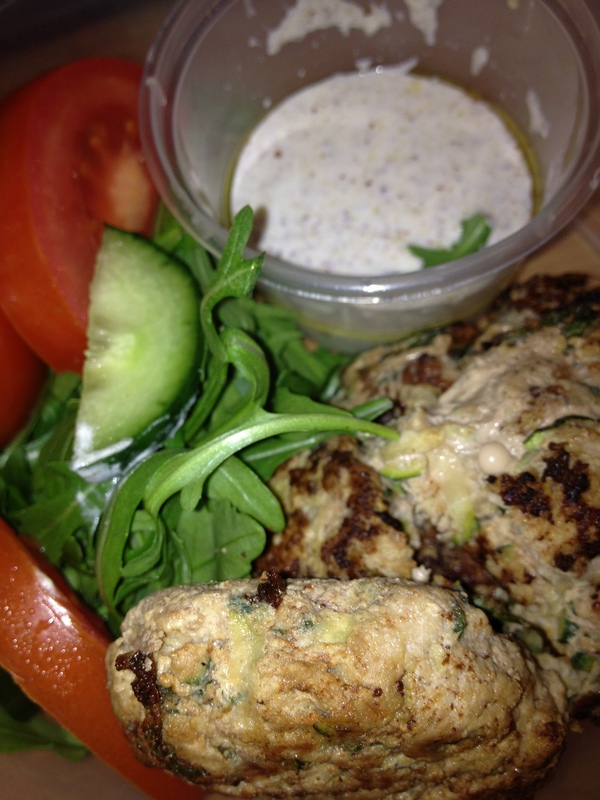 Beautiful served with a fresh green salad, what’s not to love. Delia – the Doyenne of British Cookery. Everybody has a Delia recipe under their belt don’t they? Well no they don’t actually. Some people have a few of Delia’s books and have barely given them a glance since they mysteriously made their way onto the book shelf – that would be me. So I was quite excited to try out a recipe from this book which my parents gave me (having had it lying dormant on their shelves for some time). Despite some confusion over black turtle beans, I did manage to get all the ingredients together to make this very tasty dish. 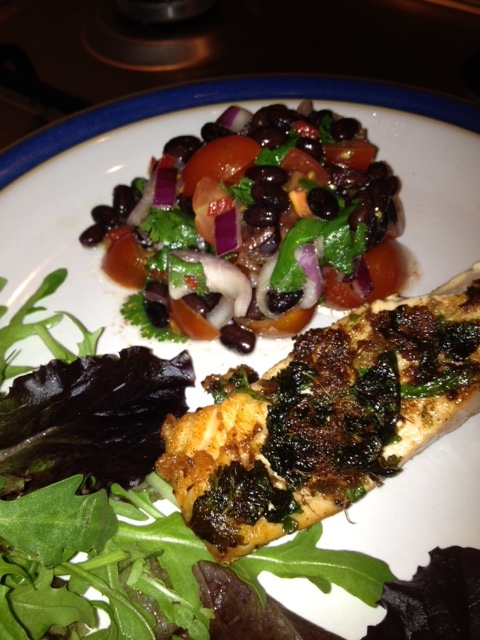 Salmon marinaded in lots of gorgeous flavours – ginger, lime, garlic, chilli and a punchy salsa made from black beans, tomatoes, corriander, chillie and lemon (I used lime). It was fresh, it was punchy, it was bold and verging on dangerous (sorry I was channelling John Torode for a moment). God bless you Delia, they were right all along, you are brilliant! Again cheating and again a “stinker”. I was actually quite excited about this one. Puy lentils – which I love – in a dressing mixed with pulled ham haugh and topped with a poached egg. The downfall of this particular dish was the dressing, or perhaps the downfall was actually me. The dressing included a splash of sherry vinegar and I am unsure whether I added a little too much therefore murdering the dish OR if it would have been on the ‘iffy’ side anyway. We will never know as I do not intend to make this again. Sorry Olive! So I admit that this is not from a recipe book therefore it technically doesn’t count towards the challenge, but for two weeks I was a wee bit ill and so was the little Grumbling Tummy and I didn’t sort out my challenge recipes. However I did cook a couple of new recipes from my Olive magazine. I will try to make it up before the end of the year but thought I would add these into the page anyway. Just my just desserts for cheating – this one was what my family would term as a bit of a “stinker”. Bland salmon with bland noodles and not nearly enough spice and fire in the recipe to make it interesting. Enough said on this one. This quote from the back of the book says it all for me. Nothing turns my stomach more than the sight of my husband fishing anchovies out of a jar and eagerly chomping on them. They taste ok I guess but they are wierd bony little buggers and I just don’t get the appeal. So when B decided that my week eight challenge should be grilledTuna Steak with Salsa Verde, I thought him quite cruel. You see the Salsa Verde consists of – dijon, parsley, capers, olive oil, garlic and anchovies – I was far from impressed. But entering into the spirit of the challenge I decided to go for it. IT WAS BLOODY BRILLIANT! Have had it twice now and it is on the shopping list for next week. I have never had salsa verde before but all these l ingredients pulsed together make magic. Griddled tuna is beautiful anyway and this sauce makes it something really special. I would happily serve this healthy fresh dish at a dinner party. 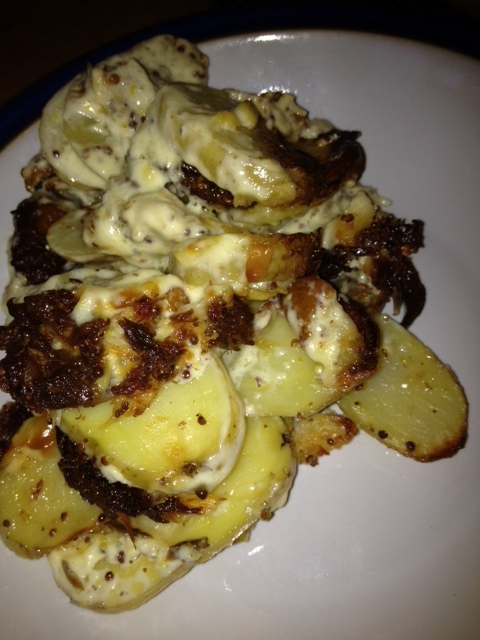 I served it with some rocket and some new potatoes which were mixed with a tiny bit of mayo and lemon juice. Of course the best bit for B is having constant access to anchovies! I loved watching the fantastic TV series which accompanied this book. I desperately wanted to go to so many of the places Rick and his ‘wee dug’ travelled to along the canals of France in their charming barge. Before long the TV series worked its commercial magic and BC bought me the book. I have loved pouring through the pictures of France and lovely dishes but I have never even attempted a recipe from it, it just looks too damned complicated. BC has been choosing all of the dishes for me in this challenge and I was nervous when he chose this – what the hell is macoronade? I decided to cook it for a dinner party (brave!!) and knock me down with a feather – it was simple. You kick the whole affair off the day before with a spot of 24 hour marinading – blade steak with veg, herbs and spices in a whole bottle of red wine. The next day it is really as simple as browning the steak, which took on the beautiful dark ruby red of the wine and then cooking the meat and wine marinade for a couple of hours with olives until the meat is tender. The Macoranade is cooked macaroni layered with gravy from the stew and parmesan then grilled. The verdict …… excellent. 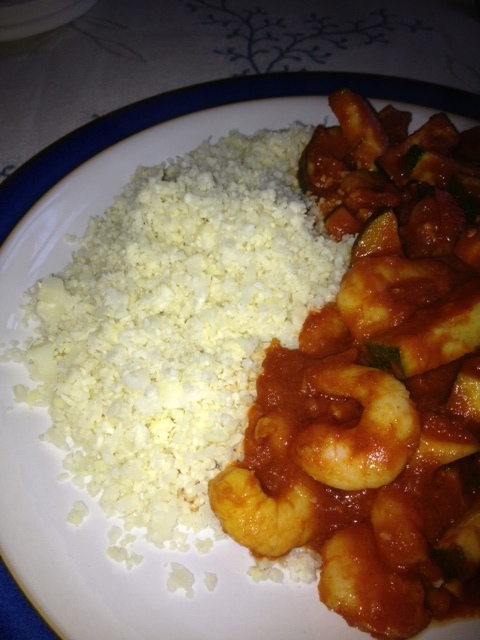 Everybody loved it although we all found the concept of pasta with our stew a bit odd, although not in a bad way. 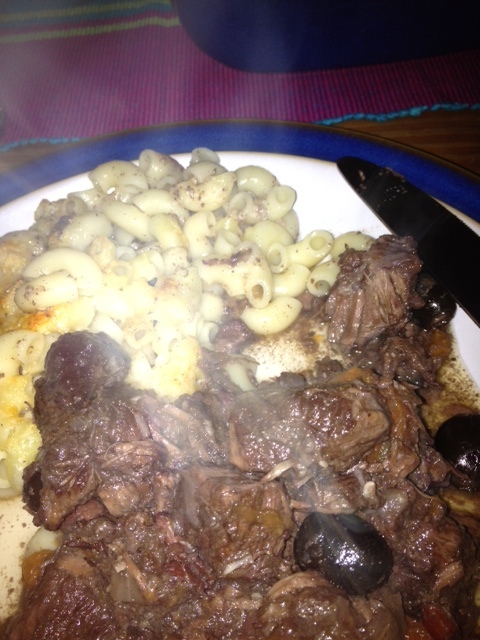 The flavour of the marinade completely infused the tender beef and the cooked down wine gravy was stunning. I loved this and will make it again for a bit of an occasion. Now here is an unpleasant tale to tell! I decided to make a low GL (Glycemic Load) cake from this book because frankly I was craving something a little sweeter than a cashew nut, and had been on the ‘no sweet treats’ diet wagon for about a month. Had a friend coming round for coffee so seemed like the perfect excuse. The key to this recipe is a substance called Xylitol. Xylitiol, so claims the book, is the best sugar substitue because it is natural and found in many fruits, plus its good for your teeth and does nothing to your insulin levels – no spikes and dips! 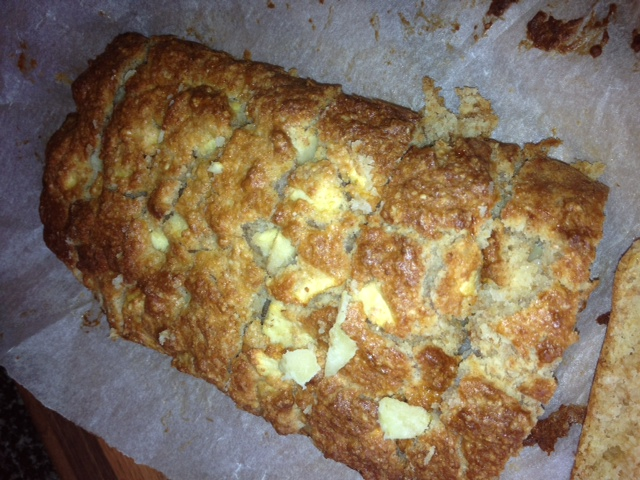 The cake uses soya flour mixed with ground almonds, eggs, butter and bramley apples. I added a little cinnamon to the mix as well. It was very simple indeed and looked pefectly presentable when it emerged from the oven. It was in fact totally delicious (not sure if this was due to a dearth of sweet treats in recent weeks). My companion and I ate the whole cake – IT WAS SMALL!! I am sorry to say this is when it went downhill. Apparantly Xylitol can act as a mild laxitive if you take enough of it. Well there was only 2oz in the whole cake, which does not seem a lot but around 15 minutes after polishing off the cake I had a violent reaction (not mild by any stretch!). My first task after spending a very lengthy time in the smallest room in the house was to put the bloody Xylitol in the bin. On the plus side – the episode helped my weight loss!! It might have been snowing outside but sunshine landed on my plate in week five. I chose a dish that was simplicity itself from the River Cafe Cookbook. Spaghetti a Limone has only 5 ingredients – lemons, spaghetti, basil, parmesan and olive oil. Ludicrously quick and easy to make – this dish screamed mediterranean flavours. If you closed your eyes you could magic yourself away to rural Italy! I loved it – it was clean, simple, fresh and got me reaching for the holiday brochures. In fact I loved it so much that I forgot to take a photograph, by the time I remembered there was clean plates all round. In the past I have dabbled with organic veg boxes, but in the end there was too many carrots and tatties involved for my liking. I know that they are a brilliant idea, seasonal and local and everything and it is just the sort of thing I ought to do BUT I love mediterranean flavours and a dearth of aubergines in December would have me sneaking off down the shops for clandestine supplies. Before I gave up the ghost on the veg box idea I bought a clever little book called Box Clever which contained lots of recipes for the veg in your veg box. I have never used it though flicking through I can see there are lots of tasty sounding (no pictures!) ideas. 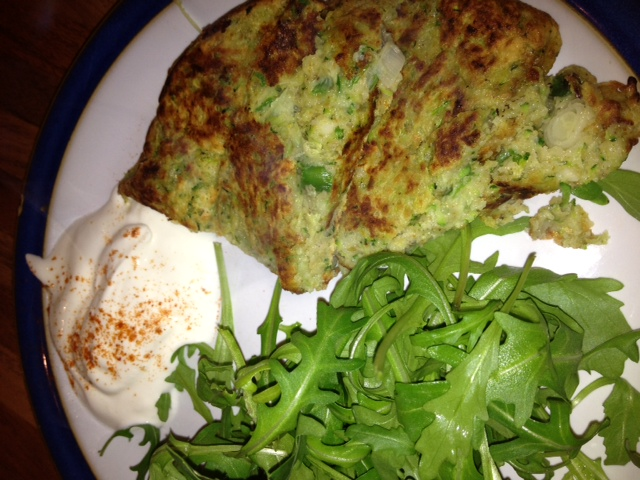 I went for Curried Courgette pancakes because I had some spare courgette kicking about and it didn’t need much else really – some curry powder, flour, egg, garlic and that was about it. The most complicated part of the process was grating the courgettes and then squirting the juice out of them. Apart from that it was a mix it all together job before putting spoonfuls into the frying pan to make little pancakes. I was in recovery from a bit of a tummy bug and so was in a sort of ‘cannae be bothered’ frame of mind, so instead of little pancakes I dolloped the lot in the frying pan to make one stonking big pancake. This could have been the downfall of this dish (or perhaps not). The result was a green stodgy bland blob which was edible but only just. I will give the dish the benefit of the doubt – perhaps my ‘cannae be bothered’ attitude had an effect but I aint going to go for a rerun to find out. Bloody Nora! I fell foul of marinading yet again. This time I really can’t blame the way in which the book is written, it is as clear and simple as can be. The chicken in this really lovely dish was meant to marinade herbs, spices and lime juice for at least 2 hours …………… lucky if it was half an hour. This book has been well used but seems to have fallen out of favour. No idea why as it has some cracking wee recipes in it and they are all extremely simple to achieve (if you actually read them properly). Essentially this dish involves grilling the marinaded meat (I actually cooked it on my griddle pan) then adding to a mix of cream, chillies and onion. 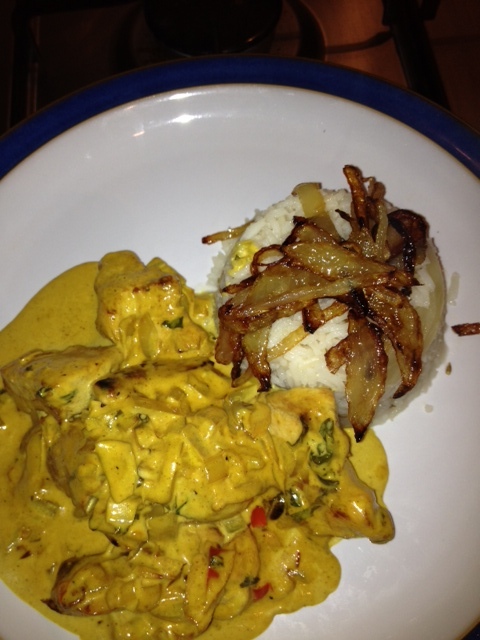 The result was a beautifully fragrant and creamy curry. I didn’t think it resembled any Tikka Masala I have ever tasted but it was lovely all the same. I served it with Ainsley’s Pilau rice which was infused with the flavours of star anise, cinnamon, cardamom and cumin complete with crispy onions on top. I want to say that this picture does not do the dish justice – it looked much more impressive in reality! I have no idea why I have this book at all as the TV series drove me to distraction, mainly due to Jamies inabiity to talk to any American without calling them ‘brother’. That aside, this is one of the books on my shelf that I could have easily wrapped up and given as a gift. It is virtually untouched by human hand. Not seeing anything that completly jumped out at me, I let BC do the choosing for me. 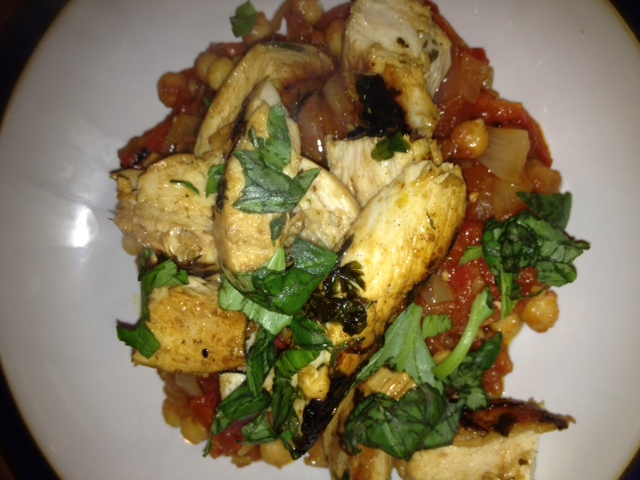 He seemed to like quite a few of the recipes but settled on Chicken on Chickpeas which actually looked rather nice. This is where Jamie and I are going to fall out again. The recipe book is written in a strange way which makes it really hard to follow, and so I missed the fact that the chicken should marinade for at least two hours. As I kicked off making this for Sunday nights dinner at 8.30pm that was not going to happen. It marinated for 20 minutes if it was lucky! All my moaning aside it was actually really lovely and I think I may have to look a little closer at the other recipes in the book, I may have been too hasty. This recipe is chicken marinaded in lemon, parsley and garlic and then cooked on a hot griddle; served on a glorious stew of roast peppers, chickpeas, paprika, tomatoes and chillies. I actually did a whole post on this one as it was my first week of the challenge. This recipe book had not been more than flicked through casually in its 10 years on my shelf, despite loving Greek Food. The meat pie I origninally intended to make confused the hell out of me and so this sub was brought in. It is not (to my mind) a pie but more of a baked fritatta. It was really suprising simple and something I will definitely make again. Feta, oil, eggs, spring onions and courgettes pretty much mixed up and popped in the oven. Lovely Jubley! it 😉 I will come back yet again since I bookmarked it. Money and freedom is the best way to change, may you be rich and continue to guide others. I only wish I were rich!